Our Energy Extreme 62 contains a blend of coffee with four clinically proven nutrients: Garcinia cambogia with HCA or hydroxycitric acid, green tea extract with EGCG, an extra boost of caffeine (62mg per serving) and niacin. Our proprietary blend promotes healthy metabolism, improves and increases fat oxidation and physical performance. 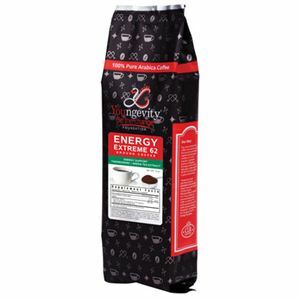 100% Pure Arabica Coffee Beans, Green Tea Extract, Caffeine USP, Garnicia Cambogia, Niacin.